Utah State University President Noelle Cockett spent her first full day on Eastern’s campus visiting students, faculty, staff and community leaders April 3. Cockett reached out to students to better understand what needs to change at Eastern. Cockett spoke to each of the three groups; students, faculty and staff separately, with no crossover in between groups and no administration. It created a safe space so all felt like they could speak freely and frankly. After hearing about pride the students had for their school, Cockett shifted the focus to degrees at Eastern. She wants to continue to bring more options and bachelor’s programs to Eastern. Cockett also focused on the importance of Career Technical Programs, or CTEs, and hopes to grow those programs on Eastern’s campus. SUN Center president, Cody Merritt, asked why the recreational classes were taken away, and Cockett said she would love to find ways to partner with the community recreation center to bring back some of those programs. Head soccer coach, Ammon Bennett asked, “What is your commitment to us (Eastern athletics) when our budget is so much smaller than the schools we go up against.” Cockett claimed USU has an athletic budget contributed by donations and ticket sales. The president met with faculty for an hour and half and discussed many of the same issues discussed in the prior meetings. She believes Eastern needs to train more education majors and add CTE programs. The College of Agriculture wants Eastern’s programs and the community wants short-term programs like computer coding, IT, electrical, etc. She liked the idea of faculty serving on Logan committees. Eastern’s merger was not a true merger. Logan did not embrace Eastern and it slowed down the engagement, support and collaboration of the schools. We must celebrate Price and what it offers to students. Enrollment was discussed and the lack of growth at Eastern. She showed a chart that the enrollment from students in Carbon and Emery counties follows the pattern of the economy of the two counties. “When economic times are not as good, enrollment goes down.” Getting recruitment back on track will take time. We need to trump all the great things that Eastern is doing. She said the enrollment offices in Logan need to refocus and do a better job of getting more students to attend Eastern. 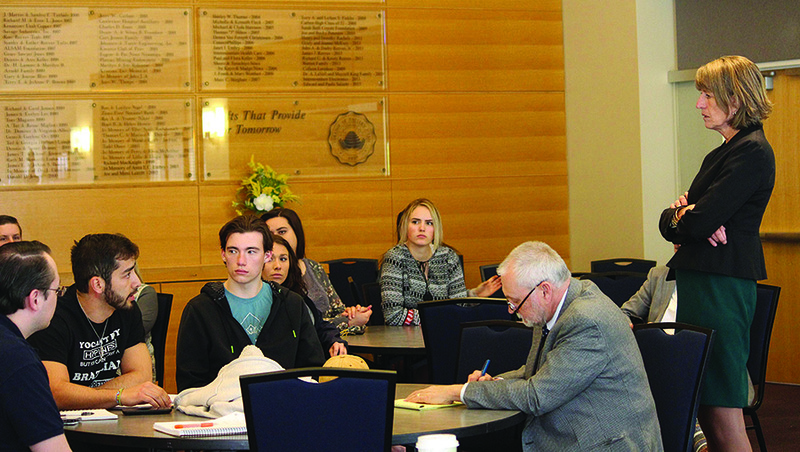 New programs were discussed including bringing in a biology major for pre-medical students. John Weber, Ph.D., described his Rural Health Program and said half of his students would stay a third year if Eastern offered a biology degree. Tyson Chappell, Ph.D., agreed and said Eastern could offer all the classes needed for the biology degree but Logan administrators will not allow it. Other bachelor degrees possible were communication studies and liberal arts majors. The welding department discussed having a four-year program instead of sending its upper classmen to Weber to finish their degrees. She said it all depends on how many students can be recruited to the program. She said technical area is where the workforce is needed. Concerning the alumni association, she was proud that the 80th anniversary was celebrated. This is a huge issue and we should never not focus on the history of CEU and Carbon College. We need to build some fences and find out who we are and what direction we want to go. Cockett plans to continue her conversations in fall 2018.